This is an EQ7 rendering of a maple leaf block. 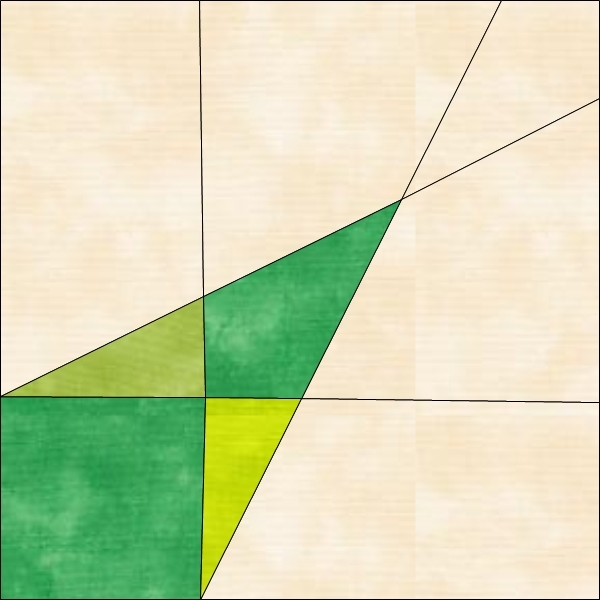 I am blogging about the progress and design decisions I am making on my husband’s quilt. I hope this will keep me on track and motivate me to continue to work on the quilt. 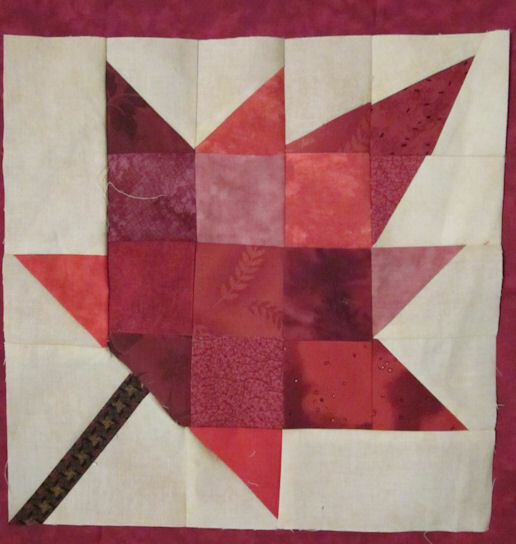 I have been trying to draft Maple Leaf pattern to the size I need using graph paper and pencils and on EQ7. I know what I want to do but so far I have not been very successful. I need to learn the EQ software better. My computer drawing skills are dismal. I posted a picture of the EQ drawings and you will see what I mean. After several attempts at designing the block I decided to wing it. Here is a picture of my success (or failure)… this will go into the quilt but I have a lot to learn. I will keep trying until I perfect the block patterns. I also have several other patterns for different types and style of leaves. I am using the inspiration I have been collecting for several years to design the quilt, but mainly it will be designed on a design wall. Design visual arts / quilts visually. THIS is a rendering of the right upper leaf point. I have done several versions of this template. You can note several mistakes on the quilt block. I made a mistake on the stem piece coloration and had to redesign the stem. I sewed the block using a inset seam technique but I should have just used an oversize block and used a half square triangle sew on the stem bloc instead. I did not realize I could use that technique until after I finished the block. YOU can also note the point on the leaf is out of alignment. I need to work on improving the template for the point of the leaf. My plans for this quilt are to include every technique I know and want to learn. 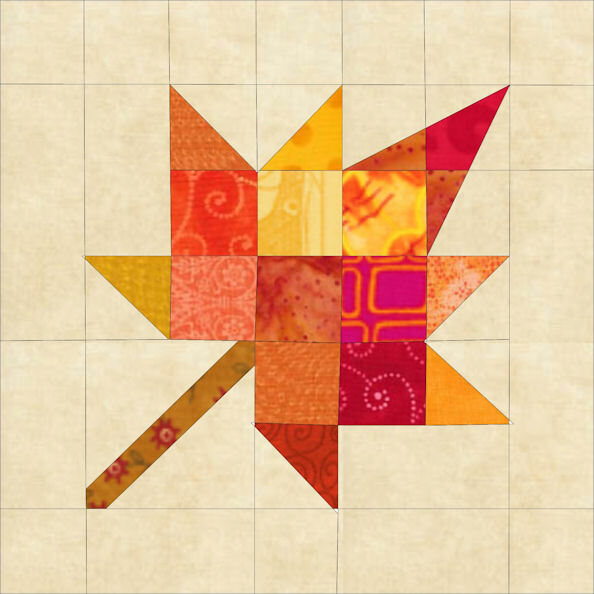 I will be doing paper piecing and piecing quilt blocks, adding applique leaves by machine and probably some hand applique too. Going back to my earlier post, PLAGUED BY UNCERTAINTY, I have the explanation of my thoughts about the color and style. (Give away is in effect until end of June or early July, depending on my work schedule. Just leave a comment and the win the chance for some books I am giving away.) 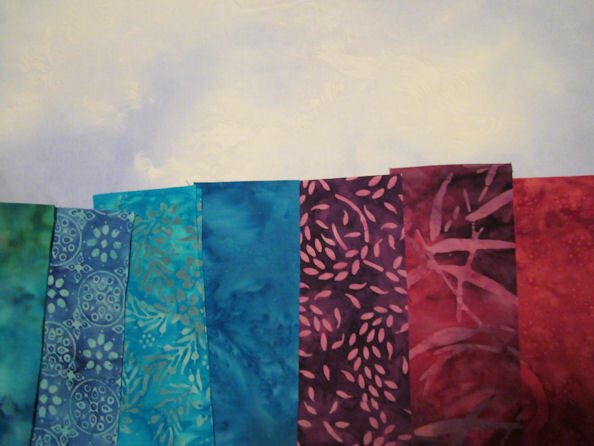 I have re-purchased the fabric for the background, 11 yards of SHADOW PLAY by Maywood Studios. This is in excess but I NEVER WANT TO BE SHORT FABRIC AGAIN. Any left over fabric will be used in my stash. Every Tuesday, Sandy of Quilting for the Rest of Us post a lesson as she explores her stash and apply the principles she has learned. Sandy has several other bloggers link up on her blog so that you can connect with them. Here is my exploration of my stash in relationship to EXPANDED ANALOGOUS COLOR HARMONY. Sandy used five fabrics… I am cheating and using a jelly roll from Timeless Treasures. I cut jelly roll strips of every fabric I buy to put into a collection for future quilt projects. 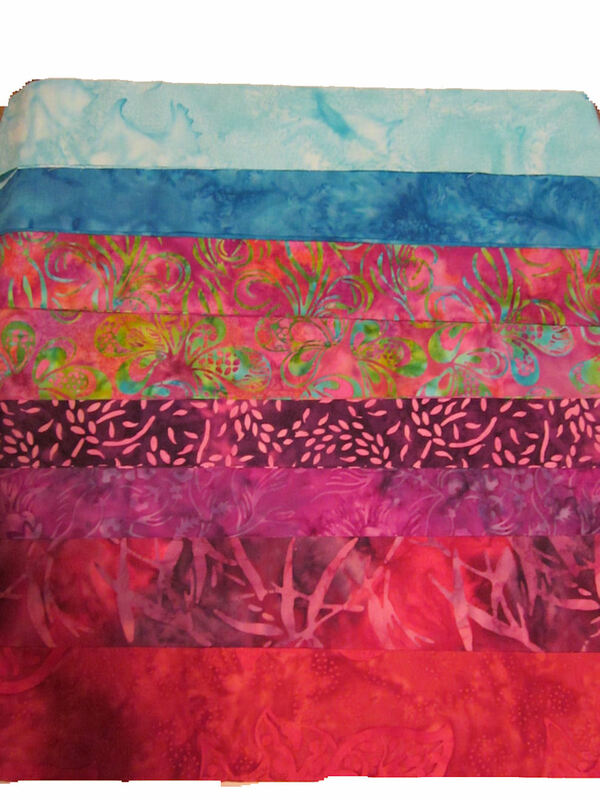 I am thinking about making a quilt using the TT jelly roll but supplementing it with fabric from my stash. It is turning out to be a little harder than I thought it was going to be. HERE I used the commercial jelly roll strips in the RED, RED PURPLE, PURPLE, BLUE PURPLE (VIOLET) AND BLUE (CYAN) (Primary colors: red and blue.) I included a couple extra fabrics that stretched the harmonies even more. 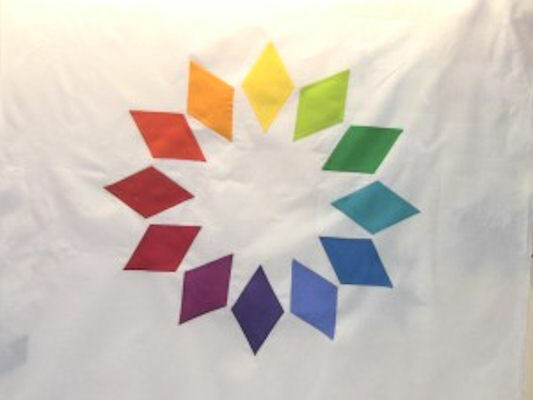 According to my readings the extended analogous harmonies as long as the colors touch each other on the wheel. Some of my fabrics use accent colors to make their pattern. Some of the fabrics use neighboring colors to provide pattern. 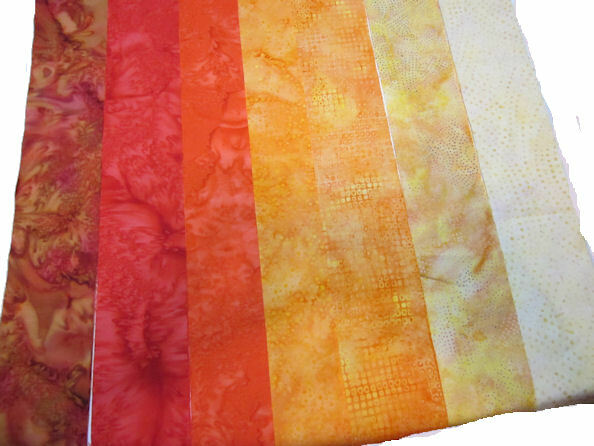 My second selection of fabrics are red, red-orange, orange, yellow-orange, and yellow. 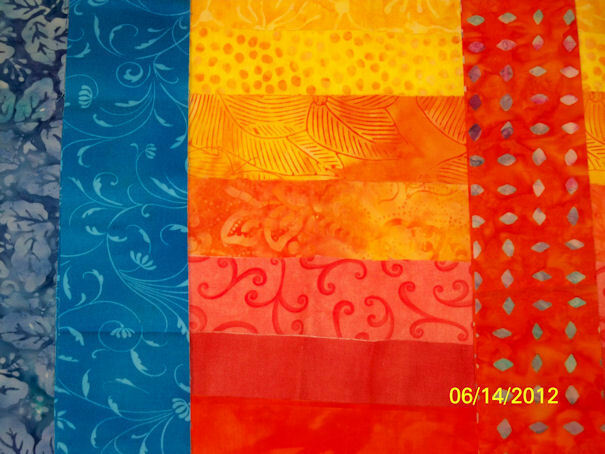 ( Primary colors: Red and Yellow) I include some bridging fabrics from my own cuttings. Playing with these fabrics are in preparation for a quilt I want to make. What I am finding is I do not have enough value variations, the majority of my fabrics are mediums and darks…. I need more lights. 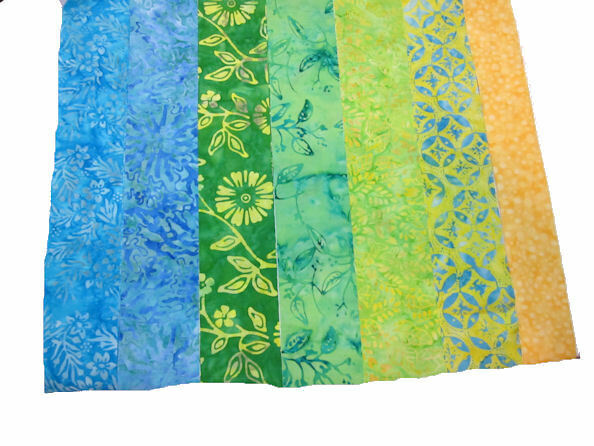 This collection of fabric strips are blue, blue-green, green, yellow-green and yellow. Primary colors in this collection is blue and yellow. The rest are combinations and blending of the primary colors. I have three yards of this wonderful white and pale blue sky looking fabric that I plan to use as a background to a special quilt using my collections of jelly roll strips commercial and self cut. Here is a preview of what I am playing with, one day I hope to show you the quilt. 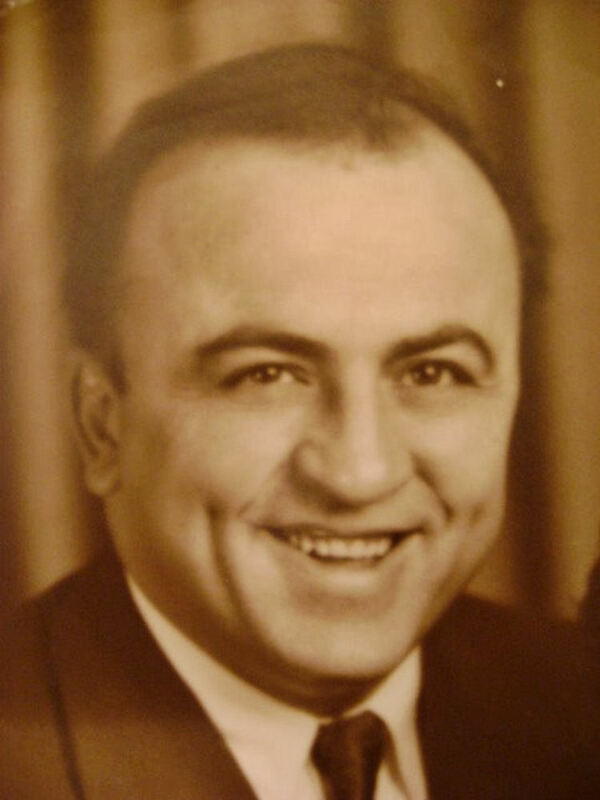 My sister found this picture of my dad from 1948… He was so CUTE! Handsome too. I always loved the twinkle in his eye. Since I am behind on my homework and the original linky is closed, I am posting my ANALOGOUS with an ACCENT color way here. I used my original colors and then went across the color wheel ( COLOR MAGIC for QUILTERS) and selected Turquoise as my accent. Here I selected the turquoise is moderated by green. 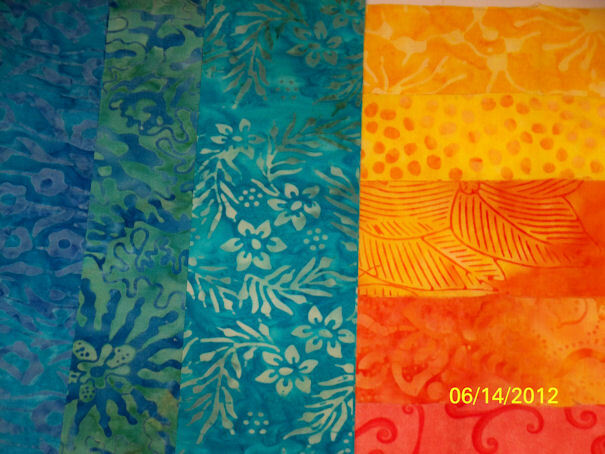 These batiks they have green mixed in with them which is typical coloration of batiks. Batiks often have ANALOGOUS coloration to give them a textured appearance. The ANALOGOUS color selection and the accent are all medium to medium dark in value. The background to my project will be a light. I will make other blocks using dark values. This third picture shows a bridge fabric on the right side. It is a strip of fabric that uses the accent colors as part of the pattern. It would help blend in a block made with ANALOGOUS with an ACCENT patches. Bridge fabric can also include the accent color as the main color with accents of the analogous colors. You can also note, I used different accent fabrics, more of a TRUE BLUE coloration. I cannot decide which coloration I prefer. I will say I do not care for complementary colorations, but that we can discuss when we get to complementary color schemes in the future. JUST SOME FUN COLOR WHEELS AND COLOR LINKS I HAVE FOUND …. THEY may ask for a donation but I just clicked through … I do not donate to site that ask for money. Shows different color schemes and really highlights the principles that SANDY has been discussing on her blog. Oh, I need to take some pictures to make this site prettier. I think I had better get busy! CHECK BACK as I will be adding to this list of links .